Netflix (s NFLX) unveiled its Global Speed Index website Monday, aggregating performance results from its 33 million worldwide subscribers in one place, and allowing users to see which ISP offers the best Netflix performance in their country. And guess which country is leading the charge, offering its citizens some of the fastest Netflix speeds? That’s right, the United States. However, U.S. broadband only came in first because of Google (s GOOG) Fiber, whose very few actual customers saw an average Netflix speed of 3.35 Mbps in February. Second in is the U.K., where Virgin customers averaged 2.37 Mbps during the same month. At the bottom of the list is Mexico, where the fastest ISP averaged at 2.10 Mbps. 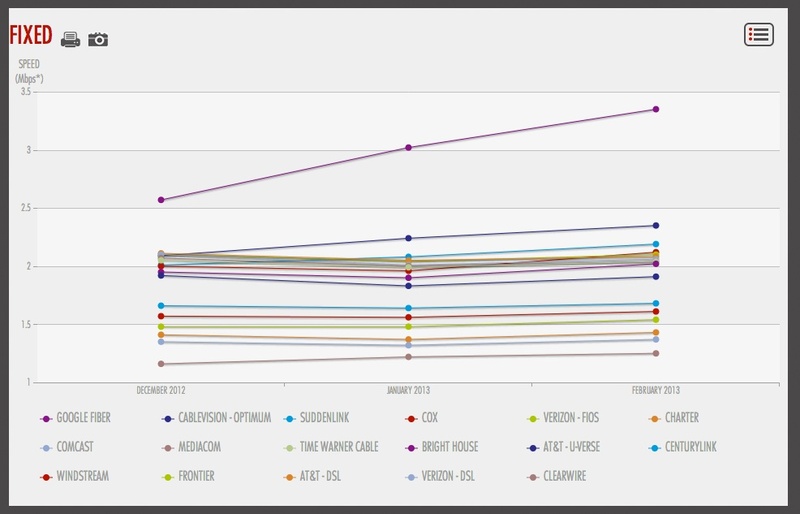 How U.S. ISPS are performing for Netflix viewing. Still, the site is an interesting tool to compare broadband speeds both within the countries in which Netflix is active as well as between those markets — and for the company, it’s another way to nudge ISPs toward signing up for Netflix’s own CDN. Photo courtesy of Shutterstock user Sashkin. This is not a global index as Netflix is not available globally. It is a speed index from 33 million members from around the globe. Most notably absent from the list: Canada.